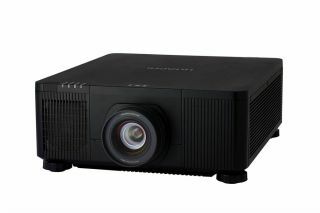 Hitachi America Digital Media Division introduced the LP-WU9750B model, the first ever solid-state laser projector from Hitachi. The new laser diode light source offers approximately 20,000 hours of operation time and is maintenance free; there is no lamp or filter to replace providing a dramatic reduction in the total cost of ownership. Utilizing DLP technology with WUXGA 1920x1200 resolution, the LP-WU9750B can provide 24/7 use for digital signage applications and is a perfect choice for heavy use in large auditoriums, conference rooms, museums and concert or stage productions. Additionally, 8,000 ANSI lumens light output and 20,000:1 contrast ratio results in a super bright display with image clarity and uniformity. The engine is protected with an air-tight, dust-resistant seal that minimizes the number of dust particles that enter the engine that could eventually lead to decreased brightness. This design gives the projector resistance against the effects of dust and allows the projector to be used in a large variety of environments. This model also comes with five digital inputs including HDBaseT, two HDMI, DVI-D and 3G SDI. Seven optional lenses are available; compatible with Hitachi’s 9000 series allowing for projection distance ranging from 33-749 inches, some installations may vary. The LP-WU9750B is compatible with the Crestron Integrated Partner program and the AMX Device Discovery protocol, to facilitate use in A/V systems using Crestron or AMX control. The model also supports web control and PJLink. The LP-WU9750B is backed with a generous warranty and Hitachi’s world class service and support programs.